Elsie Lee Dent Khan was born August 3, 1942, in Roduco, NC, to the late Bishop Howard Dent and Martha Lewis Dent. Surrounded by her family, she peacefully slipped into her Father’s arms, on November 6, 2018, at her home. Elsie graduated from Central High School in 1962, Gatesville, NC. She was a strong believer in higher education as she obtained numerous degrees; A.A.S. in Drug and Alcohol Technology from Roanoke-Chowan Community College, in Ahoskie, NC and undergraduate degrees in Psychology and Religion from Liberty University, in Lynchburg, VA. She most recently received an Honorary Doctorate of Theology degree, from Bible Institute of America Theological Seminary, in Raeford, NC. As a daughter of two godly parents, she accepted Christ at the age of 8 and received the baptism of the Holy Spirit at the age of 12. Elsie devoted her entire life to ministry at St. John Holiness Church, now known as St. John Community Christian Church, in Roduco, NC. She was a member of her first choir, known as the Sunshine Band. Later on, Elsie became the pianist of the group, The Gospel Chimes. She started the Annual Youth Day ministry at St. John Holiness Church. 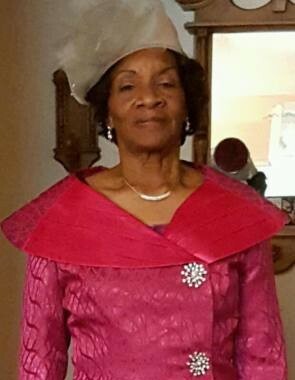 She served in many other church roles including member of the hospitality committee, providing personal guest housing to visiting pastors, and startingthe Nursing Home ministry at the church. In 1975, Elsie preached her initial sermon during a Holy Convocation. She was a faithful and dedicated member of the church for over 50 years. Elsie worked in the banking and textile industry in New York and New Jersey for several years. She also worked for the Gates County Public School System as a Substitute Teacher for approximately 15 years. As Elsie’s personal calling in the ministry was to counsel people, she worked as a prayer counselor at the CBN Station-The 700 Club for years in Virginia. Following her passion for cooking, Elsie worked as a Cook for Mary’s Little Lamb daycare, in Gatesville, NC. Left to cherish Elsie’s legacy and memory is her devoted and loving husband of 46 years Nazim Khan, and six children:Bishop Elect Andre K. Dent (Cynthia) of Gatesville, NC, Katina Redmond (Pastor Kelvin Redmond) of Raleigh, NC, Danielle Khan-Blackwell (Wayne), Raleigh, NC, Shaaneen Collins (Brandon) of Wendell NC, Nazeidre Khan-Goldsmith (Sammy) of Knightdale, NC, and Kris Khan (Tonia) of Murfreesboro NC. Elsie’s surviving sisters are Lessie Avent, Helen J. Woods (A.D.), Ruth Parker (Joey), Shirley Brown (Greg), and Dr. H. Odessa Johnson (John). Her surviving brothers are Eugene Dent and James Earl Dent, Sr. (Krystal). Elsie leaves behind a host of grandchildren, nieces and nephews, cousins, friends, and church family. Special people in her life she cherished were her friends: Mother Nellie Rountree and Hazel Yates. Elsie was a loving wife, devoted mother and grandmother, and was loved by all. She will be truly missed and forever in our hearts. A Celebration of Life will be held on Monday November 12, 2018 at 12:00pm at Soul Saving Station in Ahoskie, NC. The family will receive friends and members of the community on Sunday November 11, 2018 from 4:00pm-7:00pm at St. John Community Christian Church in Eure, NC. The final resting place for Mrs. Khan will be the St. John Community Church/Dent Family cemetery.